This past weekend in Australia was a long one - Queen's Birthday - and I decided at relatively the last minute to go to Scrapbook and Paper Expo in Brisbane, Queensland. I took the train on Friday - it left Gosford at 4pm and got into Brisbane at 5.30am. A taxi to my accommodation in South Brisbane, a quick nap, shower and some breakfast I was off to the Convention Centre. I did a class with the fabulous Fiona Paltridge "All my heart" - here is my heart. Great techniques and lots of layering,, gessoing (if there is such a word), spraying, etc - so many techniques thank you Fiona. Layout created with Colour Blast product. I need to add a photo and a title. Close up of the cheesecloth that we coloured with Colour Blast Spray - I love how you can see the layers underneath the fabric it really 'popped' the colour. 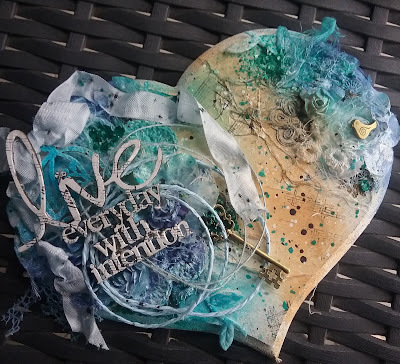 I did two classes with the equally fabulous Beck Beattie - here is the layout I created in her class "Textural Effects Mixed Media". Again I need a photo and title to be added. A close up of some of the effects on the page - embossed foil, gesso stenciling, mica chips, metal embossing. Also Beck has created her own powdered water colour paints and you can see them here in the colouring of the gesso and also on the corrugated paper (that also has gesso applied). Thank you Beck. And here I am with Beck. I have not yet finished the cards the completed in my other class with Beck but stayed tuned. I took the train back to Gosford, arriving at 5.30am again and repeated my earlier steps, back home, cup of tea, and straight to bed for a much need nap. Talk about jet lag I have invented a new lag - 'choo choo lag'. Now fully rested and ready for whatever adventures come my way.